We’ve been linked with a number of wingers already this summer, and the latest player tipped to make an Anfield switch is Swansea’s Andre Ayew, according to Portuguese outlet O Jogo. The Ghanaian winger has been linked with us in the past under Brendan Rodgers, and he’s unquestionably been one of the standout performers in a very average Swansea side recently. He’s been a real goalscoring threat when fielded on either flank for the Swans, and he could certainly play for a bigger club if he wanted to. That said though, we should really be looking at players of a slightly higher calibre, as we’re looking to push forward and work our way up the table, not settle for what we’ve got. The 26-year-old certainly wouldn’t be a bad signing, and you’d expect him to be a solid squad player – especially as he’s already proven in the Premier League. We could definitely do better though, and if the money is there to spend then we should probably bee looking elsewhere. 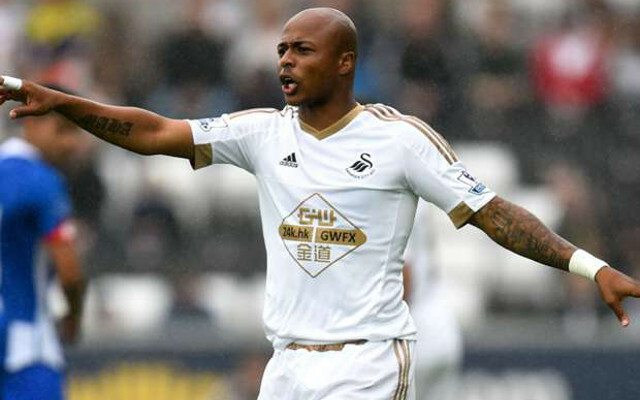 No transfer fee is touted, but if Jurgen Klopp did want Ayew he could prove to be a bargain. The report suggests that Swansea are being forced into selling the African star to fund a move to re-sign struggling Manchester City striker Wilfried Bony, so it’s certainly a good chance for somebody to snap up Ayew, even if it’s not us.